And what, you may ask, did I solve? 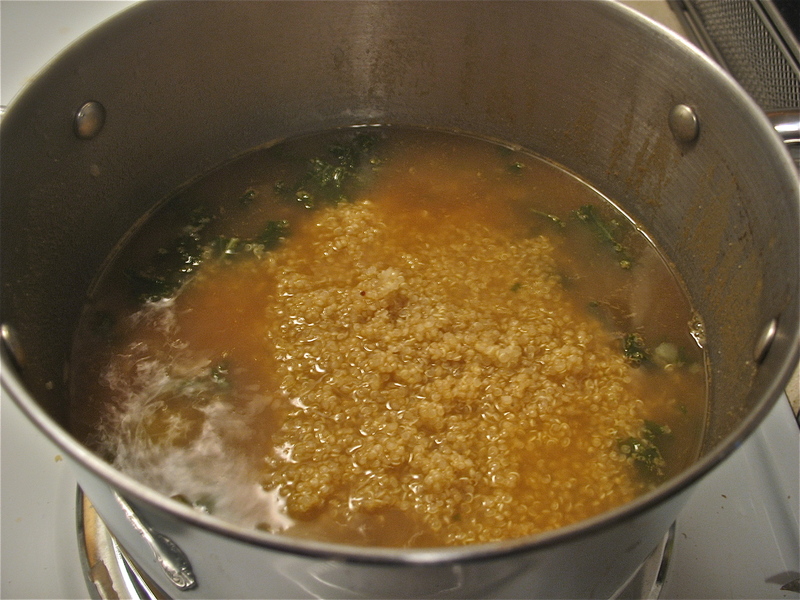 Nothing much, just the Mystery of the Quinoa Vegetable Soup! Makes 6-8 servings, depending on how hungry you are! Toast quinoa in a pan over medium-low heat for 3-4 minutes, until quinoa begins to brown and smell fragrant. Although not entirely necessary, I find this improves the taste and texture of the quinoa. However that could be my imagination. Add the water to the pan and increase heat to medium. 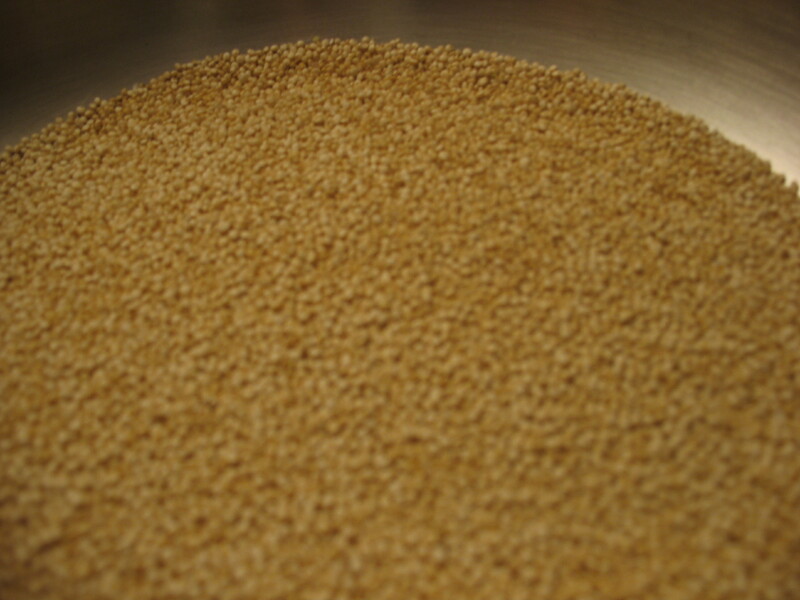 Allow quinoa to cook for about 10 minutes, or until all the water has been absorbed (very similar to cooking rice). If your water has absorbed and the quinoa is crunchy, STOP. Crunchy quinoa is not what we’re going for. 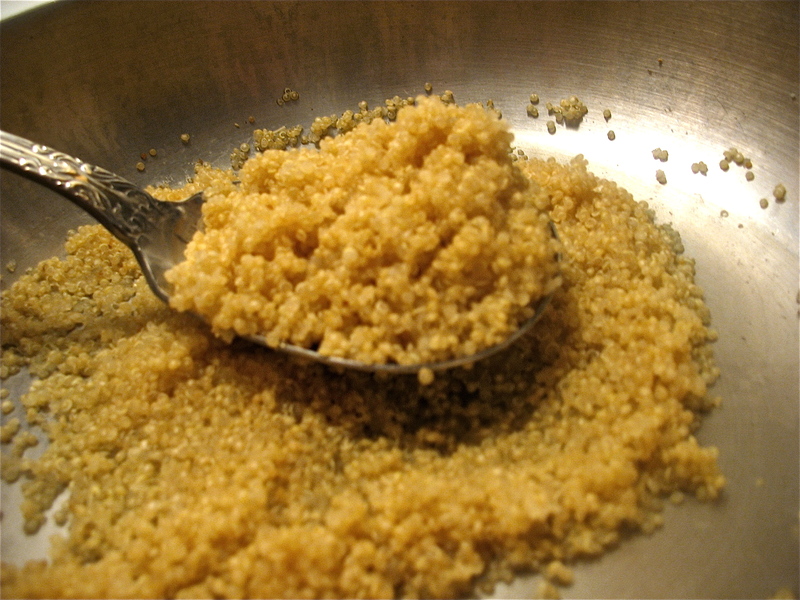 Add a bit more water to the pan and resume cooking until the quinoa is light and fluffy, chewy, but not crunchy. Once it’s done, set aside. 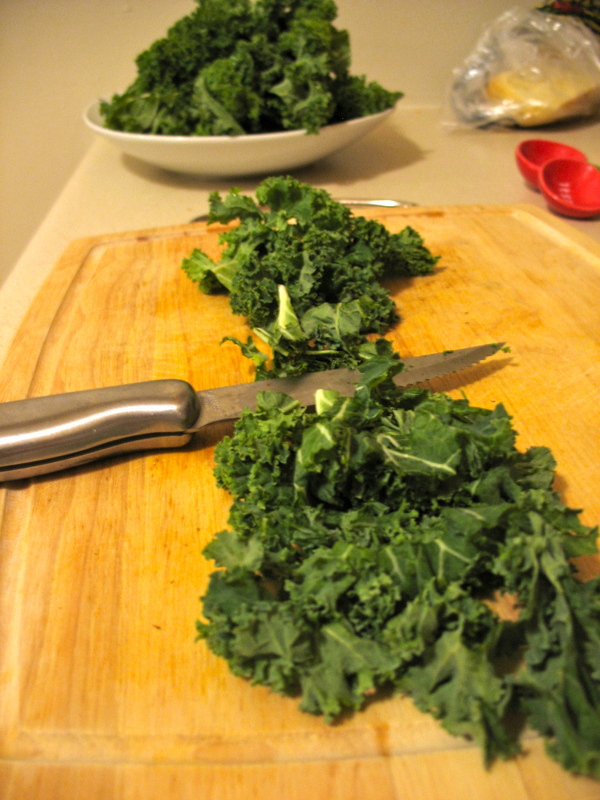 While the quinoa is cooking, de-stem your kale. 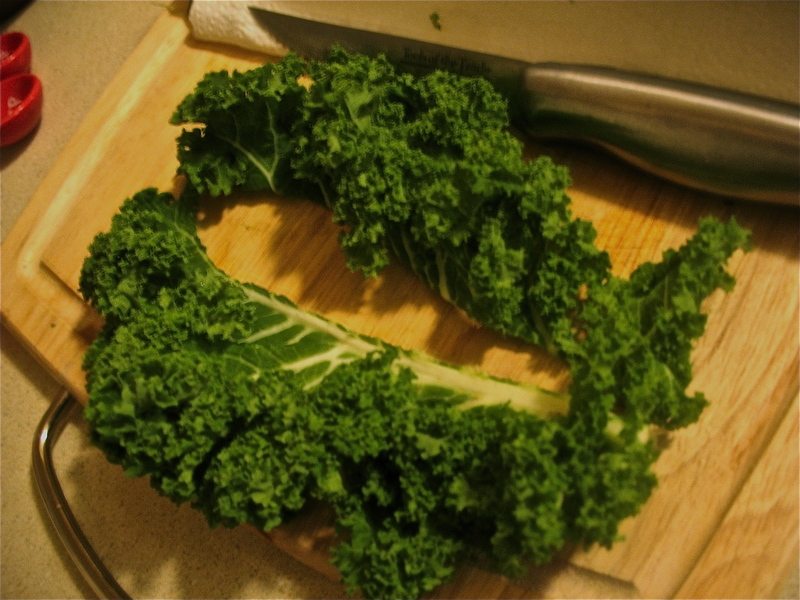 Kale is naturally on the bitter end of the spectrum, so taking away the stem tempers this a bit. Once it’s de-stemmed, chop it into thin strips. Put your broth in a big pot and bring to a boil. 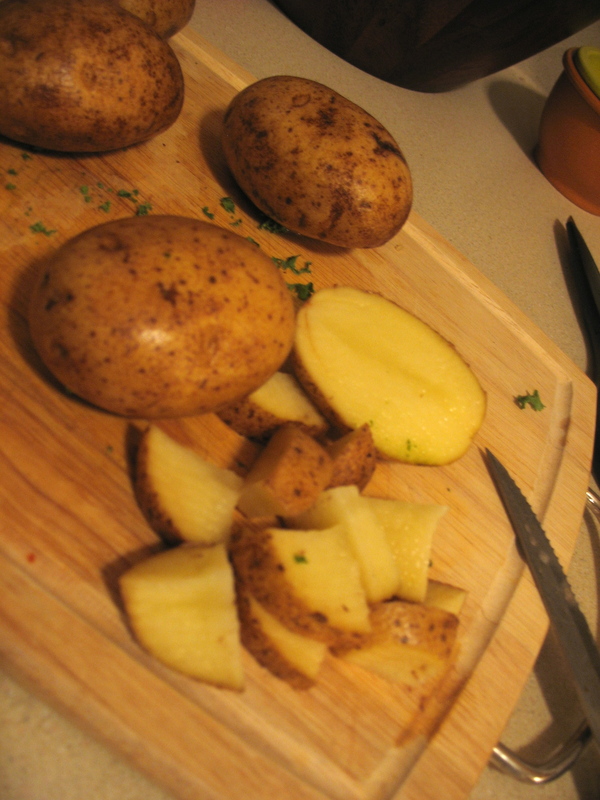 While you’re waiting for it to boil, dice your potatoes. The green stuff is definitely kale. It's all going in the same pot, isn't it? 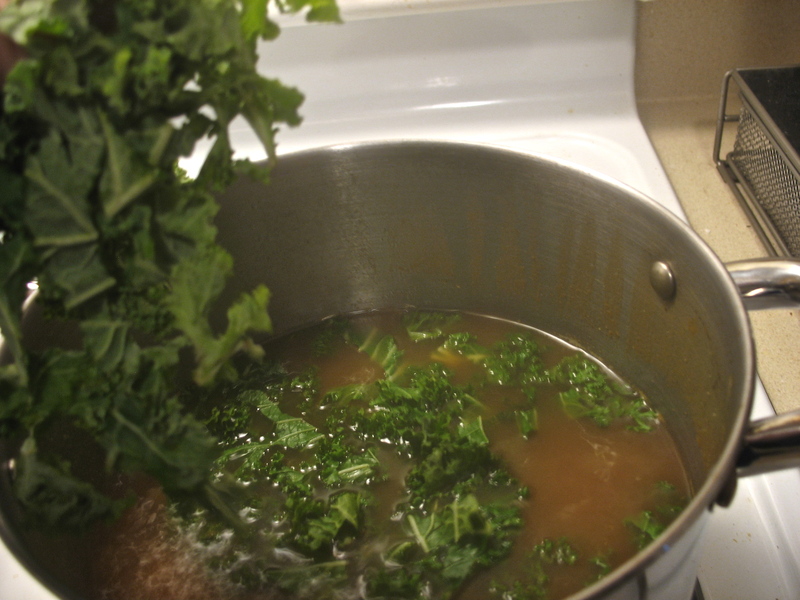 Add potatoes and kale to broth, keeping the pot at a low boil. Boil for 10 minutes. 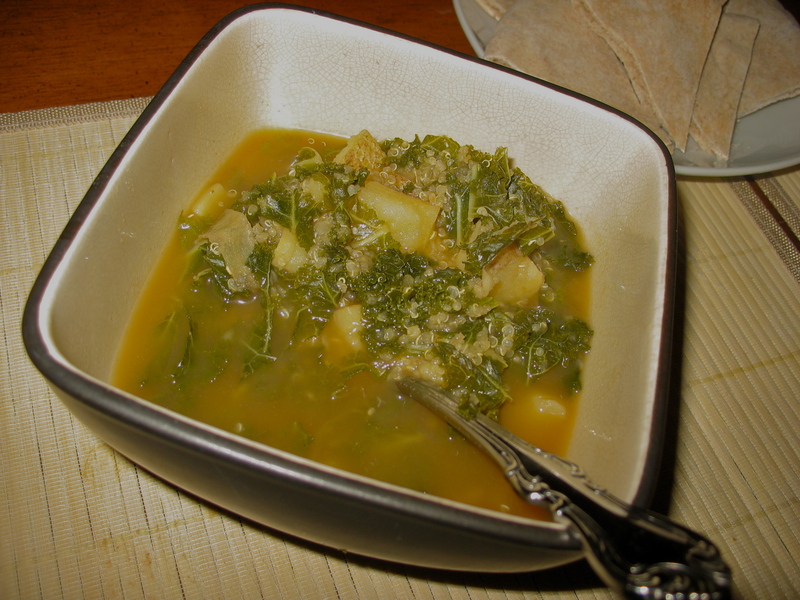 Finally, add your quinoa and cumin and bring the pot down to a low simmer for 5 – 10 minutes, until potatoes and kale are soft. Serve, garnishing with additional cumin and salt as desired. This soup is SO fantastic. The whole time I was making it, BF kept sniffing around, saying how good it smelled. I have to say, the cumin is the magic ingredient here. This was what had me ignoring everyone at the lunch table yesterday while I tried to figure out what it was. It took my friend to look up and say, “Hmm, it smells like chili,” before it dawned on me. Cumin, I’m so sorry I only ever relegated you to chili. No more. You are now free, free to be in other delicious soups and stews. The only thing left to solve tonight is what BF and I want to do. He just suggested cracking into Madmen, season four. What can I say? Another case, solved! Mmm sounds delicious. We made quinoa stuffed peppers the other night. I prefer it much more to rice.